Oncologic surgery can present some unique challenges, particularly reconstruction of either complex defects or defects in anatomically complex regions. Commercially-available implant systems are often inadequate to reconstruct some of the bony defects resulting from oncologic resection, whether they be in the axial or appendicular skeleton. The development of computer-aided design and manufacturing has permitted the production of implants customized to the patient and their defect. These 3D-printed titanium prostheses provide near-perfect fits for non-standard bony reconstructions, potentially maximizing recovery and postoperative function. They also aide in surgery by providing anatomically-correct cutting guides to optimize fit of the customized prosthesis. Furthermore, they provide options for reconstruction of anatomic regions where surgical resections previously have not been contemplated (eg, vertebrectomy) or where surgical resections have the potential to result in significant postoperative morbidity (eg, mandibulectomies in cats). 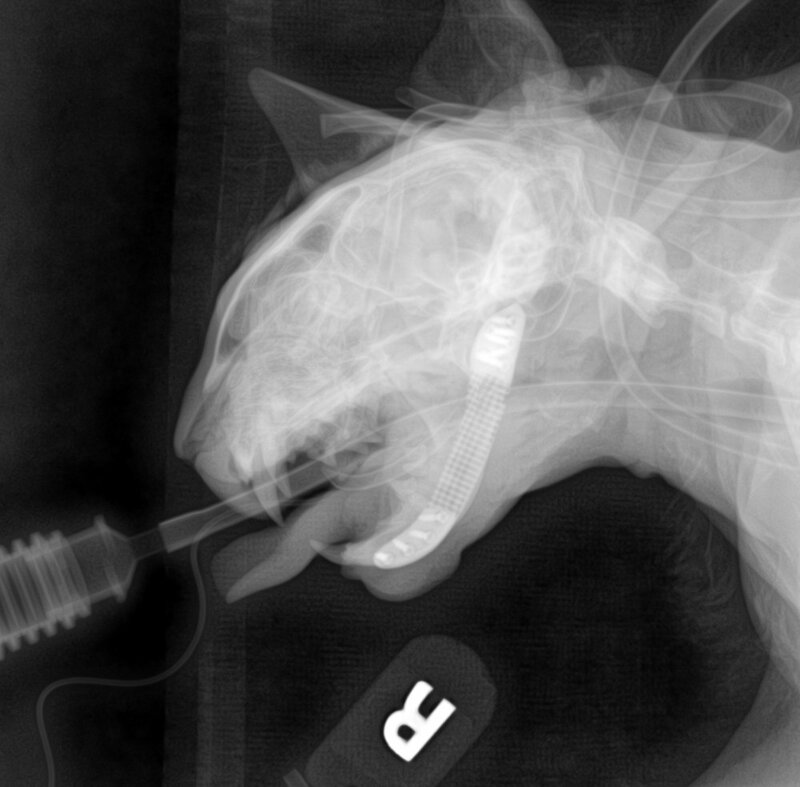 This 12-year-old cat was diagnosed with a mandibular osteosarcoma. A segmental mandibulectomy was performed to resect the osteosarcoma with complete histologic margins. A single-stage reconstruction was performed using a computer-aided designed and 3D-printed titanium prosthesis in collaboration with Dr. Jonathan Bray, then at Massey University in New Zealand. The cat began voluntarily eating the day after surgery. There was one minor complication which responded to a short revision surgery. The cat is alive, tumor-free, and eating well 3 years post-surgery. This was the first case of maxillofacial reconstruction using a 3D-printed prosthesis in any species. This was featured on David Suzuki’s The Nature of Things. We published this case report in the Journal of the American Veterinary Medical Association in 2017. Preoperative CT showing a mid-mandibular body osteosarcoma (arrows). Intraoperative image following reconstruction of the segmental mandibulectomy with a customized 3D-printed titanium prosthesis. Immediate postoperative radiograph showing reconstruction of the segmental mandibulectomy with a customized 3D-printed titanium prosthesis. CT scan performed 7 months postoperatively showing an intact prosthesis. 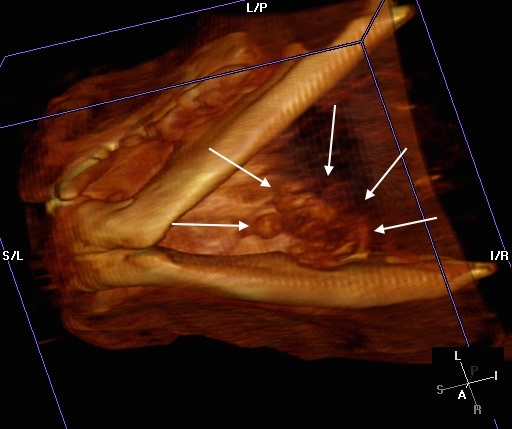 CT scan performed 7 months postoperatively showing bony ingrowth into the prosthesis (arrows). Intraosseous transcutaneous partial amputation prostheses (ITAP) have been reported by Dr. Noel Fitzpatrick in the UK. 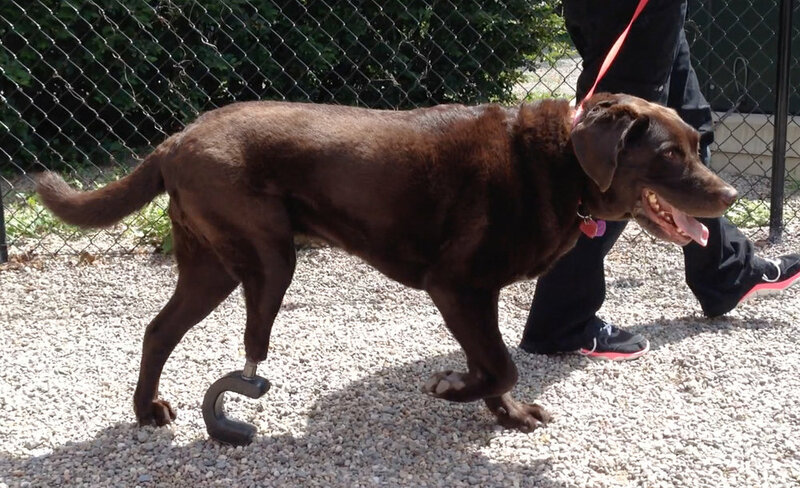 This 8-year-old Labrador Retriever presented with a tarsal osteosarcoma. The owner elected limb-salvage surgery using the ITAP procedure rather than limb amputation. The ITAP was designed and printed in collaboration with Dr. Marcellin-Little who, at the time, was at North Carolina State University. The design of the footing was the most challenging aspect following surgery. The implant eventually developed an infection through the implant-skin interface (which is the most significant challenge with these prostheses) and had to be explanted. Preoperative radiograph showing a tarsal osteosarcoma. The ITAP on a tibial bone model. Immediate postoperative radiograph following partial amputation and reconstruction using an ITAP. The foot design was challenging. This Bernese Mountain Dog had a recurrent biologically high-grade, but histologically low-grade maxillary fibrosarcoma. A revision surgery was feasible based on the CT scan, but we were concerned about the resulting cosmetic defect. The owners elected to proceed with surgery, knowing that we were also concerned about the potential for an implant-associated infection because of the location of the prosthesis. The customized prosthesis was designed by Dr. Jan Klasen in Germany and printed at Adeiss in London, Ontario. We resected the recurrent fibrosarcoma, reconstructed the maxilla with the customized 3D-printed titanium prosthesis, and reconstructed the skin defect over the muzzle with a facial axial pattern flap. Unfortunately the prosthesis did develop an infection and had to be explanted. This case attracted some online attention, particularly in medical 3D printing circles.